So now, we have Oprah Winfrey being talked about as the next President of the United States. 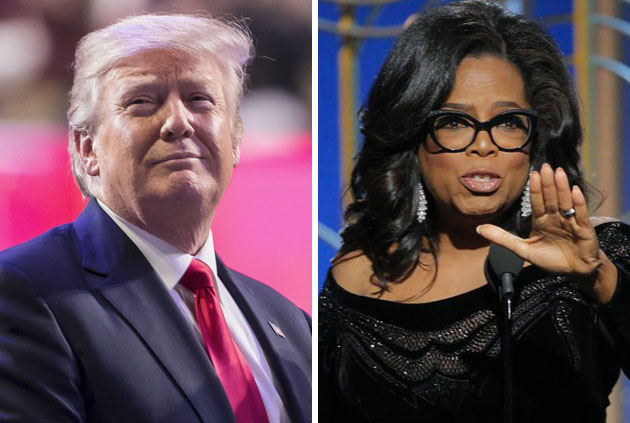 If she does decide to run in 2020, she could definitely win against Mr. Trump, although it is by no means certain. It would mean America going from being led by a reality TV star to a talk show host. If nothing else, this shows the influence of television today. It started with CNN, now almost forty years old. Before the 24/7 news channel was born, television news was serious and sober, even boring. In the early days, all the news took up 15 minutes of our time. News was separate from entertainment. CNN blurred the two. And it’s just gotten worse. Even the news programs themselves became entertainment, with participants yelling and screaming at each other. I made a point of watching “DW News” at 5.30 that day, on our PBS channel. DW stands for Deutsche Welle and is the main German news service. It does a very good job of covering world news, including American news. It is, as Sandra said, like watching events on a different planet. They are exceptionally good when it comes to European and Mideast news. Christians are told to “watch therefore and pray” (Luke 21:36). Jesus Christ said this in the context of world events that culminate in His Second Coming. These events could not possibly take place until after 1948, when the nation of Israel came into existence, so they are for our time now. So many prophecies relate to Israel (biblical Judah) and Jerusalem, in particular. The latter has become a major point of contention in recent weeks, following President Trump’s decision to move the US Embassy there, thereby recognizing Jerusalem as the capital of Israel. If Christians are to effectively “watch” world events in the context of Bible prophecy, watching Fox News for three hours each evening is not going to help. CNN won’t help, either; or any of the other US based television channels. DW News is not perfect and definitely has a slant, but at least you will have a good idea of what’s going on in the Middle East and Europe. These are the two geographical areas that the Bible focuses on when it comes to prophecy. Neither is the central area of focus of US-news based channels. One thing is for sure – neither DW nor the BBC are as entertaining as CNN, Fox, ABC, etc. But does “Watch therefore” include entertainment? The “Clarion Project challenges radical Islam and promotes human rights. We focus on the United States but also Islamist extremism in the Middle East and Europe”. The following info chart was in my mailbox this morning. 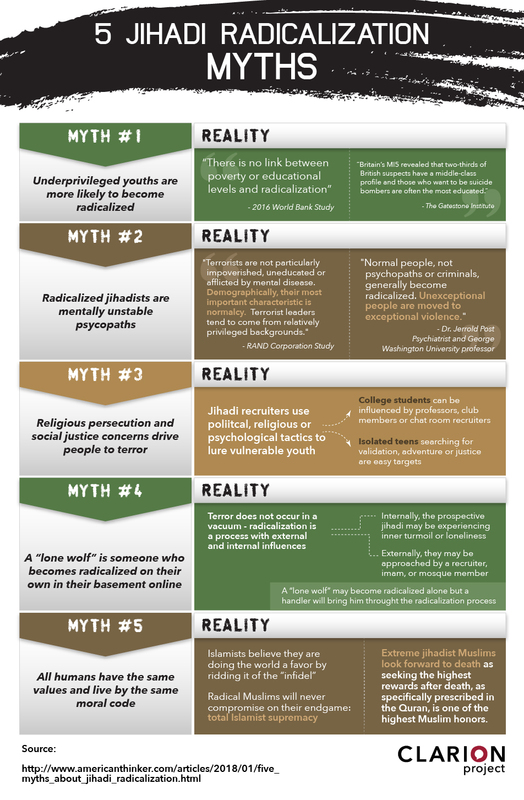 It demolishes some of the myths that surround Islamic terrorists. Mr Ramaphosa clearly fails to remember that neighboring Zimbabwe confiscated white-owned land twenty years ago; the result was a dramatic fall in food production. Two decades later, people are still going hungry. One further thought: a day after Ramaphosa called for the confiscation of white land, Donald Trump said something derogatory about Africa (and Haiti). One was condemned as “racist”; nothing critical was said of the other. It’s the usual double standard! London’s Muslim Mayor, Sadiq Khan, is also guilty of a double standard. London, he boasts, is a tolerant, multicultural city. But he threatens Donald Trump with massive demonstrations if he should visit the UK. Clearly, there’s a limit to tolerance! This may or may not have been a factor in today’s announcement from the White House — that the US president will not be visiting London to open the new American Embassy. It’s also the case that British immigration policies have led to a domestic situation that threatens the Special Relationship with the United States.